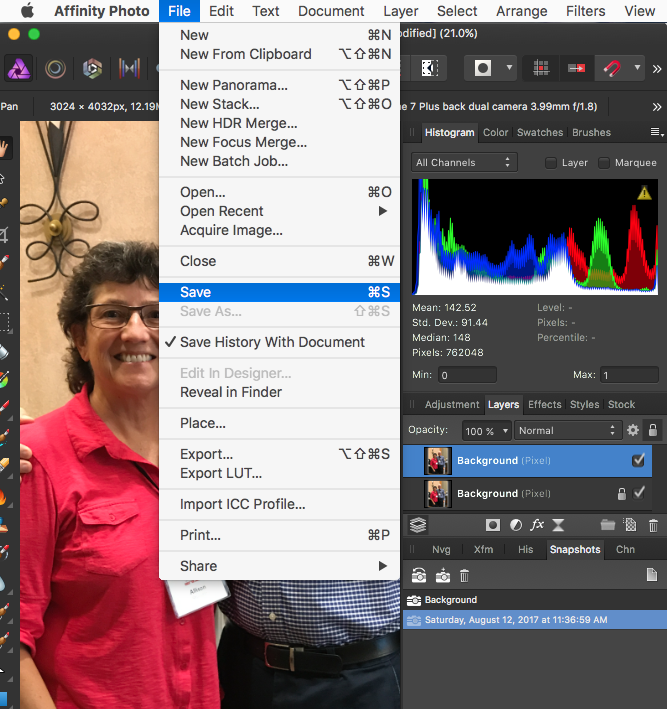 On the Mac, I opened an image in Apple Photos, then used the extensions to open in Affinity Photo. I did a whole bunch of stuff making layers and adjustments and masks. I knew I could save back to Apple Photos as a flattened image, but after I was working on it I realized that I'd like to keep the .afphoto file. I couldn't figure out how to do that. Is it not possible (if approached in the order I describe) or did I miss a button? Save As was greyed out. I know that if I opened Affinity Photo first, and then pointed to my media library I could have done it, but curious if the workflow I describe could have worked. It's easier for me to find an image (64K photos) inside Apple Photos first than it is to start the other way around. And while I'm yapping about this, I recreated my workflow using the iPad and the end effect was WAY better than the one I did on the Mac! Open the Snapshots panel, add new snapshot, select the snapshot then click the New Document From Snapshot button. The new doc will be presented and it can be saved anywhere. Interesting - hadn't seen the snapshot button before, that's REALLY cool. However, it doesn't ask me where to save either (so I suspect it saved back to Apple Photos) and save as is still greyed out. Perhaps I did it wrong? Save As is still greyed out because you are still looking at the original document, and I suspect that's because you have not followed the instruction to click the New Document From Snapshot button (it's at top-right of Snapshots panel). Ah so you mean I was supposed to read ALL of the instructions you wrote? D'oh! It worked perfectly. That's awesome, thanks owenr! I created a Clarify tutorial telling people how to do this (and of course giving owenr credit for the assist.